I have rheumatoid arthritis, but I don't like to take pills for pain. 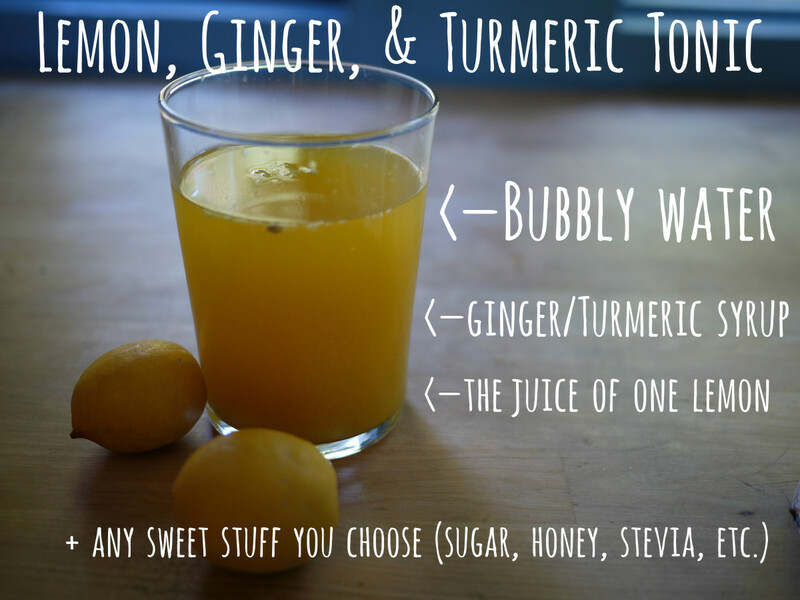 I use this turmeric ginger tonic, instead. Me: So if I don't want to take prescription meds, what are my options? My doctor: Many patients control their pain with things like ibuprofen. Me: Aren't there any dietary changes I can make instead? I'm not a big pill-popper. Doctor: I suppose things like ginger or turmeric might help. Me: How much should I eat? Doctor: I don't know. But I don't think you can overdose on turmeric. Does Turmeric Help With Arthritis? 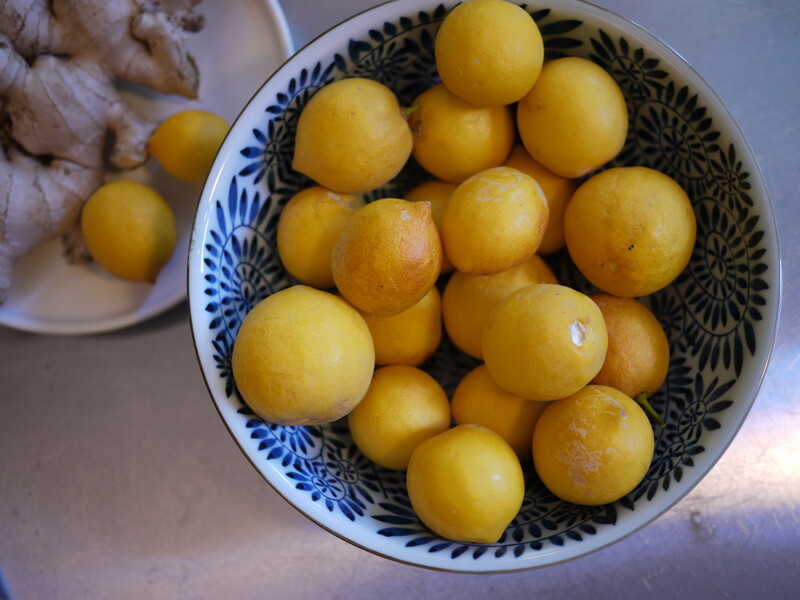 When I was diagnosed with arthritis in my spine and hip, instead of buying into the long list of painkilling, anti-inflammatory prescriptions my doctor offered, I opted to find other natural ways to deal with my aching bones. Since I'm still relatively young and unwilling to endure either the expense or the side-effects of big pharma, I knew I had to find other options. 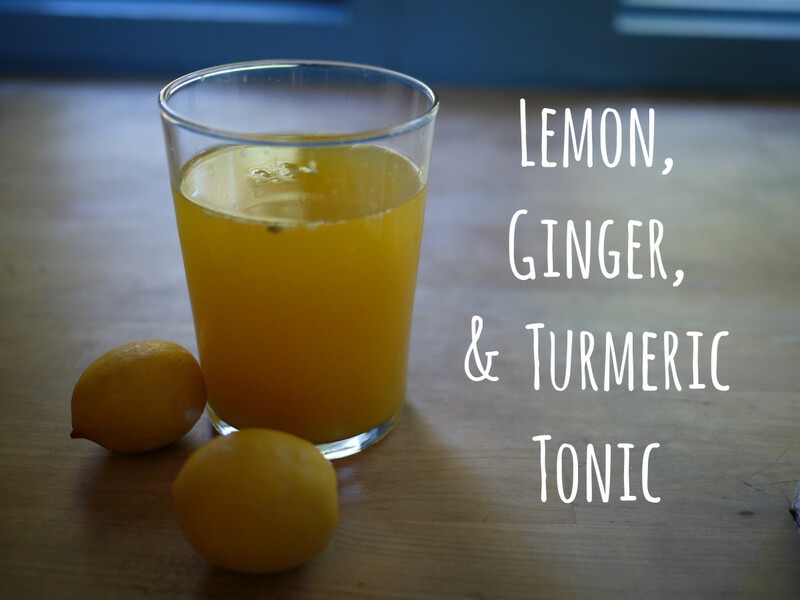 So far, a daily dose of exercise and this ginger & turmeric tonic have done the trick. I made up this recipe a couple years ago, I drink it every night, and truth be told, it gives me a little rush. 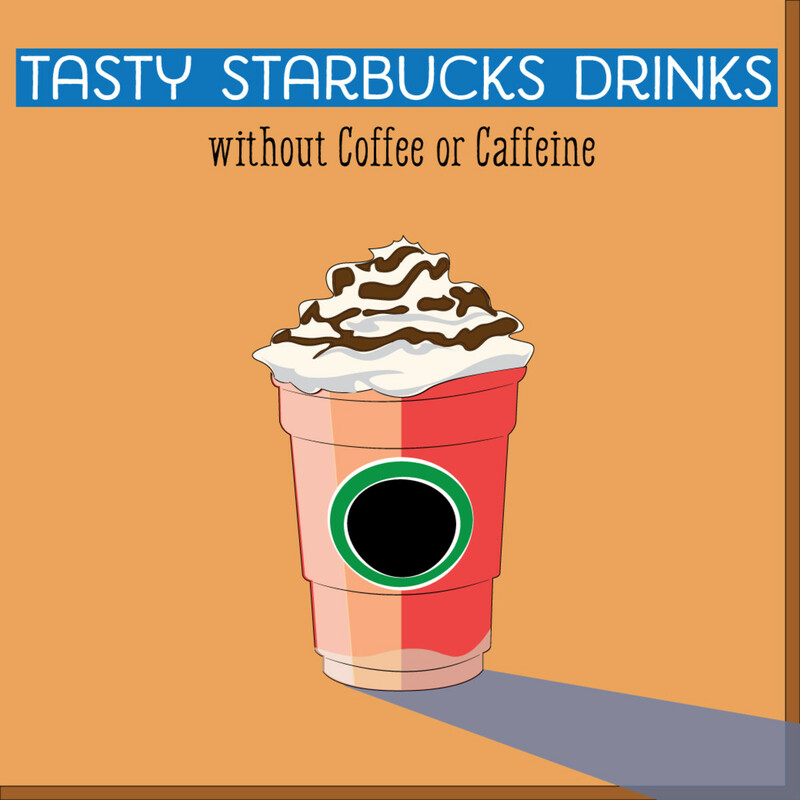 It's a strong drink, not unlike having a stiff nightcap, and it makes me feel energized and a bit zingy. (Are you sure there's no alcohol in this stuff?) The recipe below makes a giant jarful of the syrup that I keep in my refrigerator and use throughout the week. Although it is sometimes white, this is the huge (4" long) orange type of turmeric that I prefer. I recommend always choosing the orange/yellow kind over the white kind. This photo shows double the amount you'll use for this recipe. Note: This amount lasts me almost two weeks. If you're not sure you like turmeric or might not have a chance to drink it all right away, I suggest halving all these ingredients. For this recipe, you only need 5-6 oz of ginger. I bought twice as much as I need. A gadget to grate the roots (e.g. a food processor or a handheld grater). A tool to blend the mixture (a blender or immersion wand). A means to strain it (a sieve, strainer, or cloth). A bowl that holds about a gallon of liquid with fitted lid, if possible (or just use a dinner plate as a lid). Put a kettle full of water on, so it's boiling when you're ready for it. 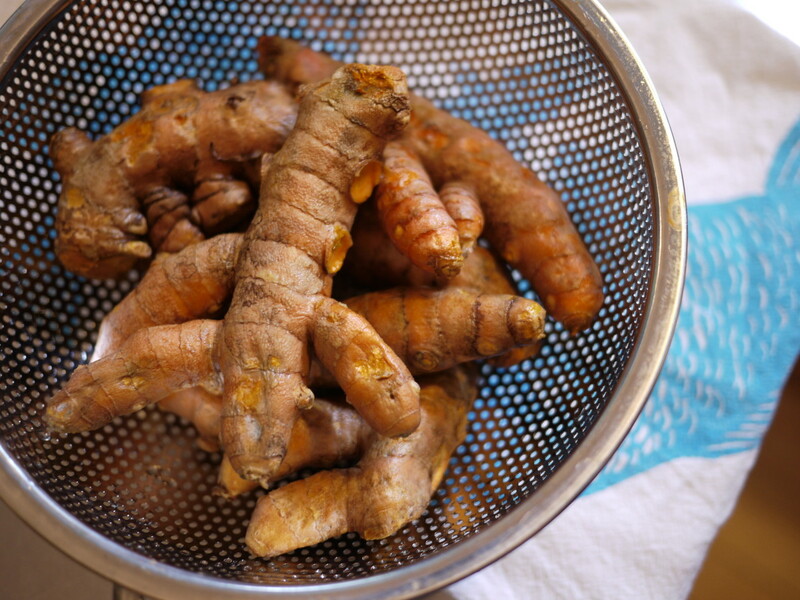 Thoroughly wash the ginger and turmeric. They say that roots are more susceptible to chemicals and pesticides in the soil, so rinse thoroughly. Grate the roots into fine bits. I use the grater attachment on my food processor, but you could grate by hand as well. Scrape all the grated bits into a your bowl, then add a tablespoon of whole black peppercorns, a kettle full of boiling water, and cover. Put another kettle on, and when it's boiling, add that in, then replace the cover. You'll be adding about a gallon of boiling water, total. If you want to use honey to sweeten the drink, I recommend adding it now since it will dissolve nicely in the hot liquid. But if you don't plan on drinking it as soon as possible, I recommend adding the sweet stuff later, as needed, to avoid fermentation. 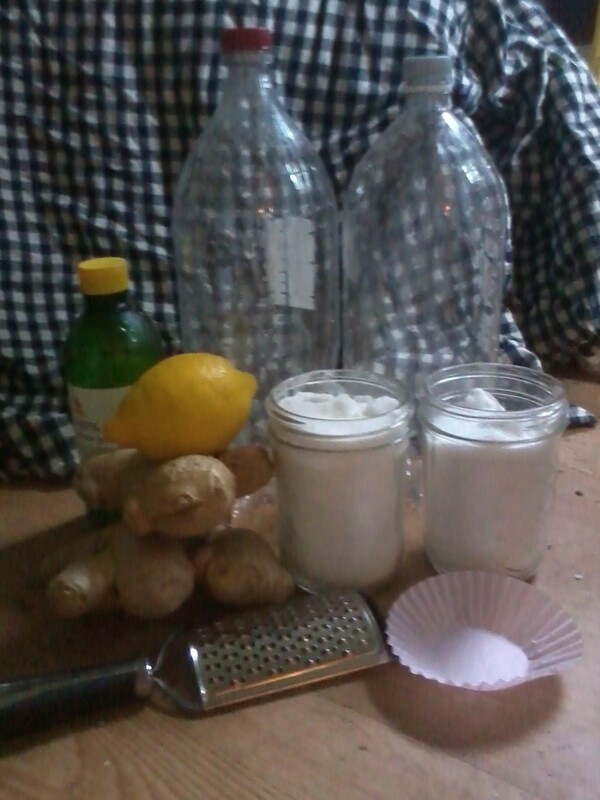 Let this concoction steep for 8-12 hours. I make it at night and let it sit on the counter, unrefrigerated, until morning. 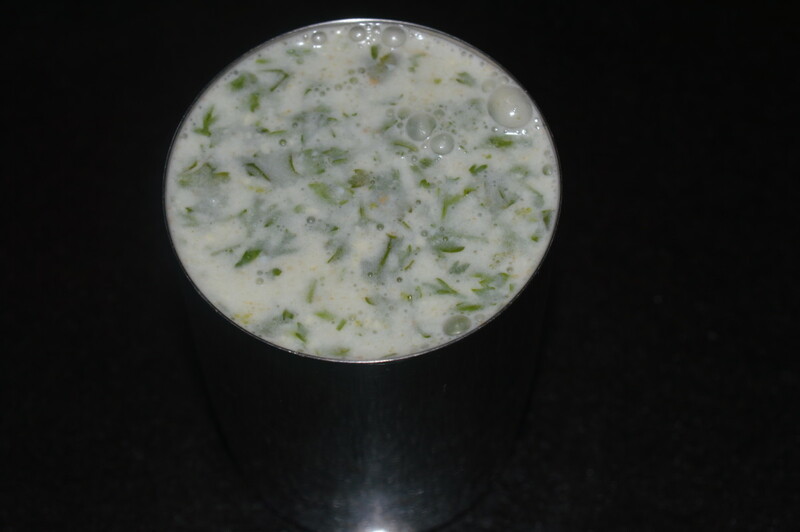 In the morning, I use an immersion blender to macerate the stuff yet again. I think you could use a regular blender, too, but I wonder if that might break up the pepper too much and make the stuff too spicy? Pour the liquid through a sieve to remove all solid matter, then cover and store in the refrigerator. The strainer I use lets some cloudy material through—it seems like a good idea to drink as much of the root as possible. Use the syrup as needed: See instructions below for mixing a tonic. 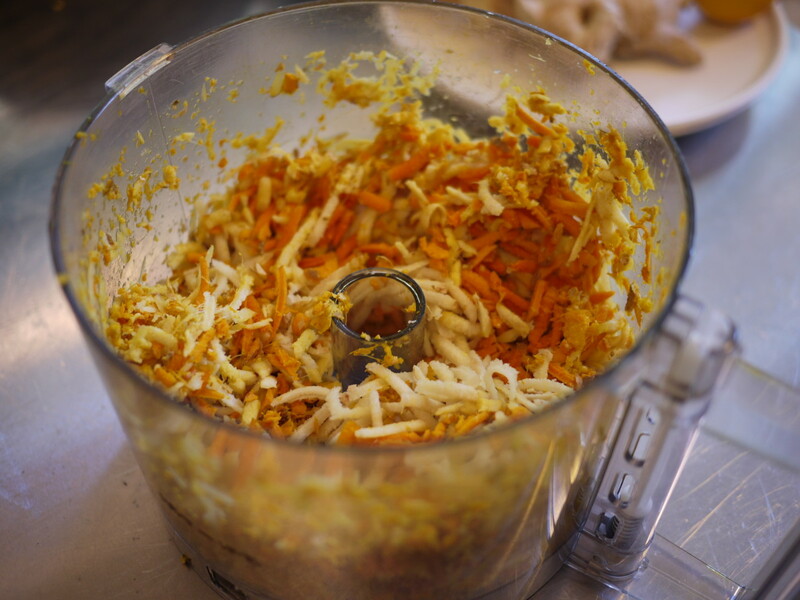 I use my food processor to grate the roots (or rhizomes, to be precise). Where to Buy Turmeric Root? Check your local store and you might be pleasantly surprised. It has been growing in popularity in the US, so maybe your grocery has it and you just never noticed before. Health food stores and Indian, Pakistani, Afghan, or halal markets are other good places to look. 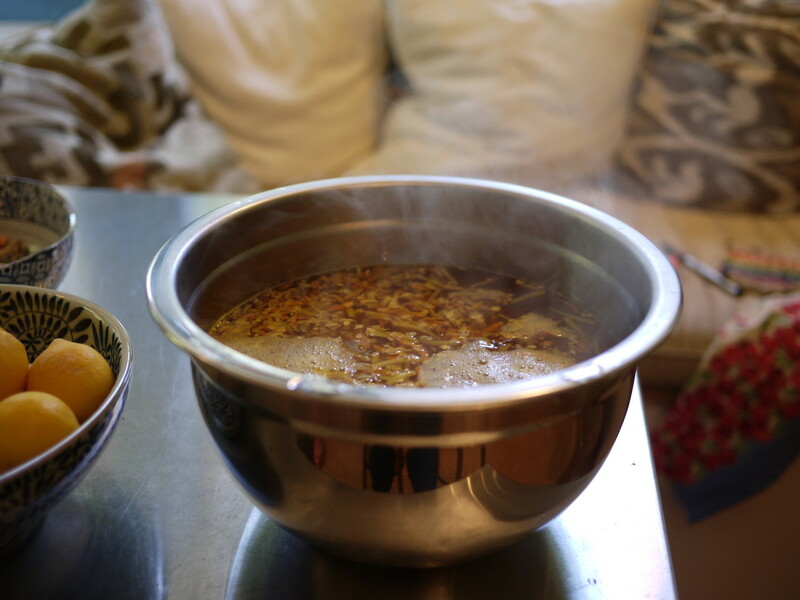 If you choose to use honey, you may want to add it in when the water-root mixture is still hot so it dissolves. Before I strain and refrigerate, I use an immersion blender to get as much good stuff as possible out of those roots. Why Use Whole Black Pepper? Anecdotal evidence suggests that the presence of piperine, the stuff in black pepper, makes it easier for your body to digest and absorb the curcumin, the stuff in turmeric. The pepper makes the curcumin more "bioavailable" and beneficial by increasing absorption. I'm not sure that this is true, but the pepper doesn't hurt the flavor, so it can only help. After blending again, strain solids from liquids: It helps to fit your strainer inside a funnel, as I do. The resulting syrup should be cloudy with fine particles of root. Squeeze a lemon into your glass. Fill about 1/3 of the glass with the syrup. If you have a sweet tooth like me, add something sweet (if you didn't sweeten the syrup already). I use six drops of liquid stevia. Top off the glass with bubbly water and drink to your health! Although there is extensive anecdotal evidence that curcumin, the active ingredient in turmeric, is an effective treatment for arthritis, one that has been used in Ayurvedic practice for hundreds of years, I could find no specific clinical trials to link to that support the idea that turmeric is an effective anti-inflammatory, because this research has not been conducted. But I did find several analyses and comprehensive summaries to support the claim, three of which I cite here. James A. Duke, Phd., in the October, 2007 issue of Alternative & Complementary Therapies, did a comprehensive review of 700 studies and found that curcumin "is a multifaceted anti-inflammatory agent, and studies [...] have demonstrated positive changes in arthritic symptoms." Therapeutic Roles of Curcumin: Lessons Learned from Clinical Trials, which states that "promising effects have been observed in patients with various pro-inflammatory diseases." Safety and Anti-Inflammatory Activity of Curcumin: a Component of Tumeric (Curcuma Longa), which states that "Curcumin has been demonstrated to be safe in six human trials and has demonstrated anti-inflammatory activity. It may exert its anti-inflammatory activity by inhibition of a number of different molecules that play a role in inflammation." 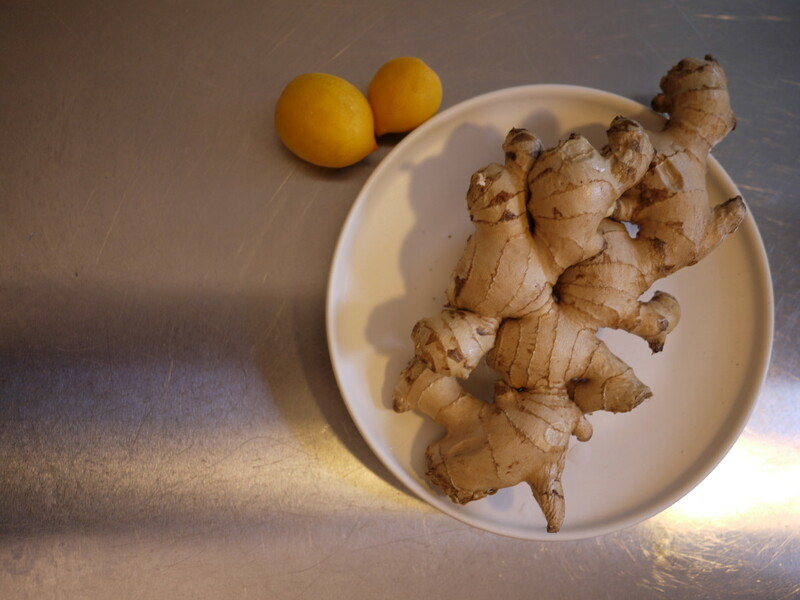 Ginger has been used for thousands of years in Asian, Indian, and Arabic traditions. Its use as an anti-inflammatory is more studied, widespread, and agreed on. This article from Healthline contains many references to supporting research. 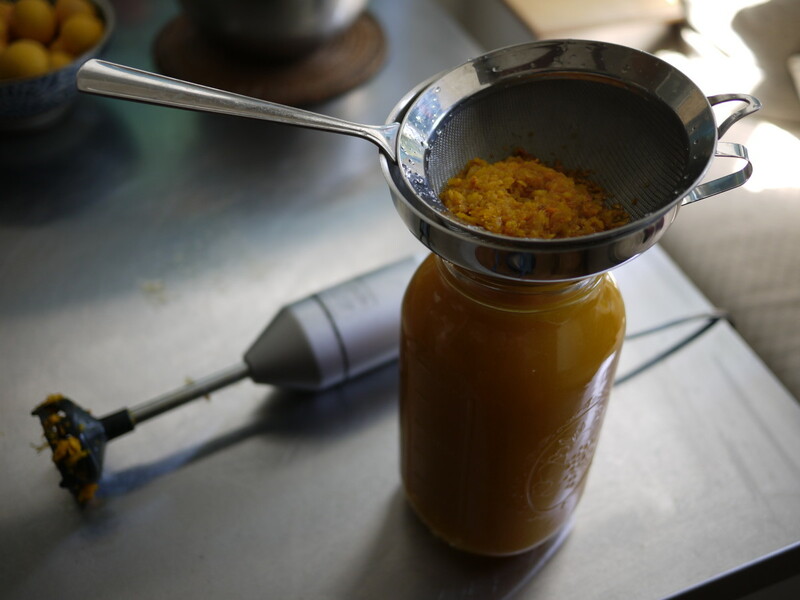 What Else Can You Do With Ginger-Turmeric Syrup? Mix it in a cocktail with whisky and simple syrup (or any drink recipe that calls for ginger ale). 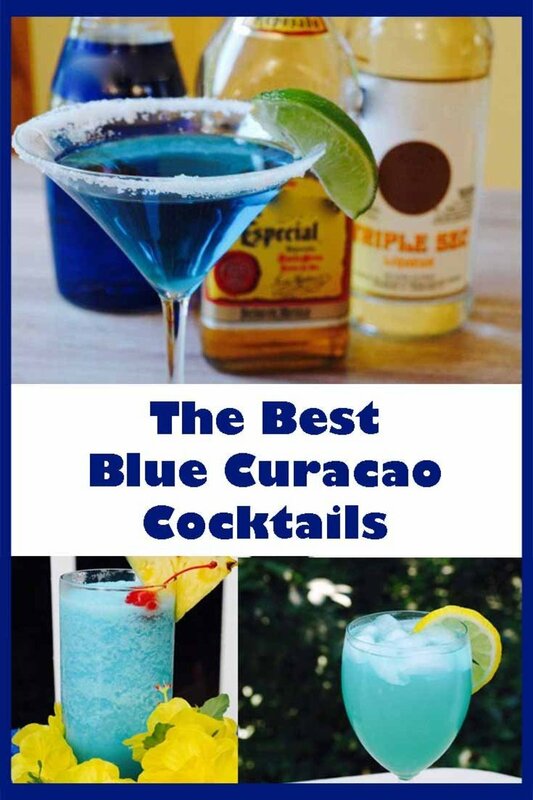 Freeze it in ice cubes to add to any drink. If you have any arthritic friends, family members who take anti-inflammatories, or neighbors who like to try new health kicks or mocktails, consider giving this stuff as a gift. How long using ginger & turmeric tonic does it take to get relief from joint pain? I noticed a difference after I'd been drinking it daily for about a week. I am not entirely consistent about drinking it—I make a new batch every month or so, and I'm not consistent about the "dose" or regularity—but I notice that I feel less achy when I remember to drink it. What Do You Think? Did You Invent Other Uses for This Syrup?